It's been a long time since I hiked all day and didn't meet a single hiker on the trail. It happened today. Well ... actually I'm lying ... I met this very slow hiker. Obstinate cuss. Black snakes have a wide variety of personalities. This guy was a rattlesnake impersonator - even 'rattling' his plain rattle-less tail and coiling up as if to strike when I tried to prod him off the trail with my hiking stick. 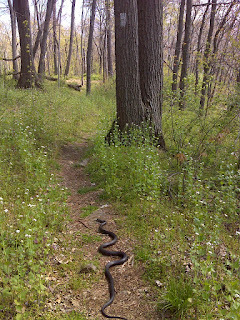 He was one of three black snakes I saw today, and I also saw two garter snakes. The warm weather is bringing them out, it seems. But where were the people on this beautiful day??? 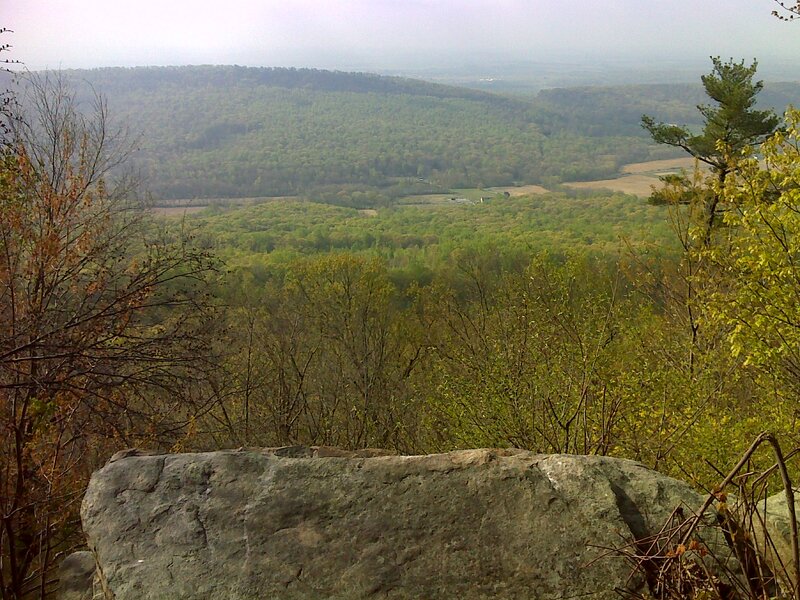 North of PA 625 there are two lookout points with similar views, one called Fisher Lookout and the other, which is so close to the PA 501 parking lot that it gets a huge visitation from non-hikers, is called Kimmel Lookout. The photo at right is a look *at* Kimmel Lookout, but it gives you an idea of what you can see *from* it also. There were a couple of cars parked at the 501 lot. Where were the people? Maybe farther north on trail I didn't hike today. The Rt 501 shelter was my turn-around point. And here I finally met someone. This is Caretaker Bob. The Rt. 501 shelter is unlike any other between here and Springer Mountain, in that it has a resident caretaker who lives in a cabin next to the shelter. This is necessary because the shelter is right by the highway. 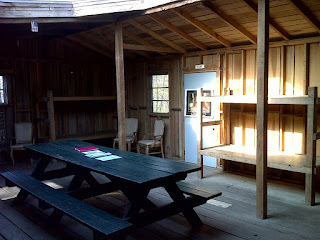 It's more like a hostel than a shelter. And Caretaker Bob takes great care of it. Below is a look inside. "The Trail beat me in 2007. I wasn't going to let it beat me again." 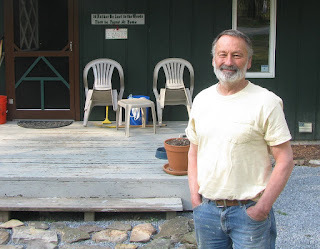 This is the story of a man who had a heart attack while thru-hiking the AT, traveling alone, hauled himself 11 miles to get help, and lived to complete a thru-hike the following year. Bob had done a thru-hike in 2001. Before retiring he was a self-employed carpenter, free to hit the trail whenever the urge struck. It was March 2007 and he had decided to do a second thru-hike. Maybe he was a little out of shape this time. No problem. He'd hike himself back into shape. And it seemed he was. Things were going well. Bob had hiked 320 miles of trail. He was through the Smokies. 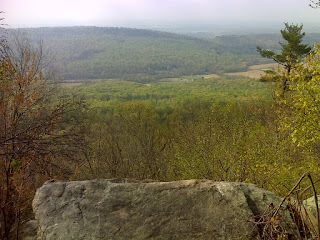 Now he was making the climb up to the memorable vistas on Big Bald, when suddenly his chest tightened up. "It felt like an elephant was sitting on it," he told me. He sat down ... rested ... and the discomfort went away. No big deal. 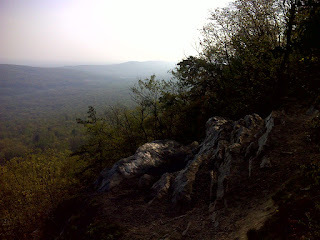 He finished the climb over Big Bald, then Little Bald, and down to Whistling Gap. Normal service resumed. Wrong. The next day Bob was climbing up from Spivey Gap alone. It's not a big climb, but it's steep. And the elephant returned - sat down on Bob's chest and this time it wouldn't go away. This time rest didn't help. Bob's family has a history of heart problems, high blood pressure, and high cholesterol. So he had a pretty good idea that this was a heart attack. "What did you do?" I asked, thinking the logical move would be to return to Spivey Gap, (US 19W) and flag down the next passing vehicle. Nope, Bob would do it the hard way. He had a reservation at a motel in Erwin - ELEVEN MILES the other way. That's where he decided to go, Elephant and all. He struggled along past No Business Shelter, climbed Temple Hill, which is not a gentle ascent, then traversed the six up-and-down knobs beyond, finally making the tough descent along the rocky ridge overlooking the Nolichucky. All these places are etched in *my* memory. I can imagine how they must be etched in Bob's. He bypassed Uncle Johnny's Nolichucky Hostel. All his trail buddies were stopping there, and Bob didn't want to bother them. On to the motel. In the lobby he collapsed. The clerk called 911. The paramedics measured his blood pressure at 70 over 30. He should be dead. The cardiologists later said it was a miracle that he could have made it that far with so much heart damage. Thru hikers are a tough bunch. They didn't have the facilities to treat him in Erwin, so Bob was rushed to Johnson City and into the operating room where the cardiologist found a plaque-blocked artery and installed a stent. Three months of sitting - doing nothing - while the heart healed. "That was the worst - I couldn't stand it." Then Bob started working himself back into shape. He was going to do a thru hike come next March. "The trail beat me in 2007. I wasn't going to let it beat me again." And it didn't. Bob's second thru hike was easier than his first. What's next? He's planning a SoBo some time in the next few years. And I have no doubt he'll breeze right through it. 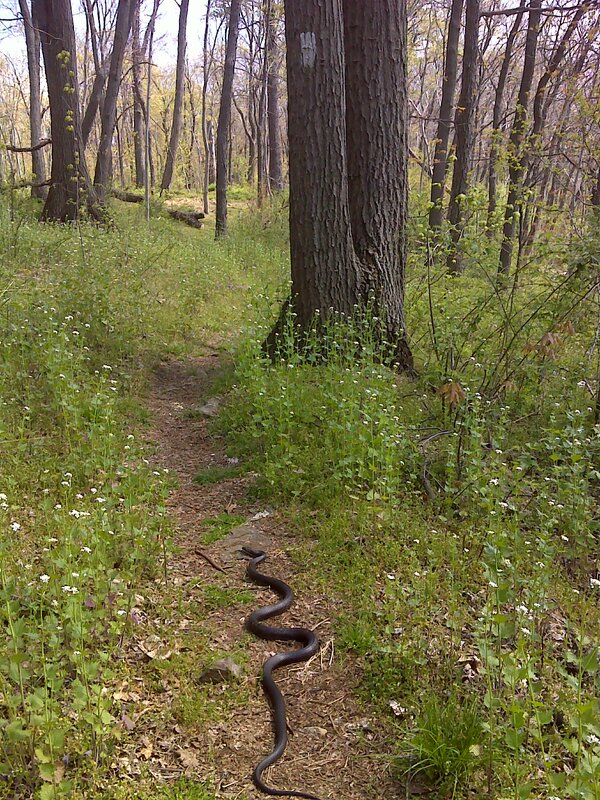 Coolest snake shot I've seen on trail. :) Great catch, awesome stories. Thanks for including us in your adventures! !